In March, Radka Kahlefeldt (Vodicková) astounded the athletic world by winning the IRONMAN 70.3 Davao, Philippines only 11 weeks after giving birth to baby Ruby. If that wasn’t amazing enough, together Radka and Ruby have has continued on their winning way throughout 2018 picking up wins at IRONMAN 70.3 Vietnam and Cebu, and placing 5th at the IRONMAN 70.3 World Championships in South Africa. 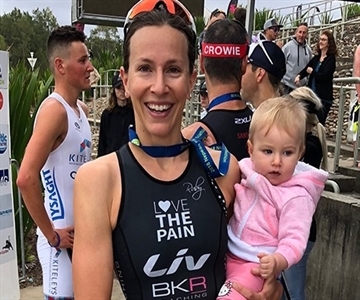 Triathlon’s Czech born and Sydney based Super Mum is keen to add IRONMAN 70.3 Western Sydney (25 November) to her resume and is looking forward to returning to the International Regatta Centre after a second place to Ashleigh Gentle in the Nepean Triathlon several weeks ago. Her marriage to Australian Olympian Brad Kahlefeldt in 2016, the birth of their daughter Ruby and the shift to IRONMAN 70.3 racing has changed her life and reinvigorated her career. Radka said that while laying in the delivery room on 6 January, her remarkable comeback to racing wasn’t always so clear cut. “I was pretty lucky that my pregnancy allowed me to train through until I went through to the delivery room. One week before I had Ruby I did a 5km fun run. I was still able to run and do wind trainer and I did 2km easy the day I went into labour. Of course, there was no speed and everything was moderated but I didn’t become totally unfit." Radka was keen to get back to racing and despite a less than ideal preparation and juggling the role of elite athlete with that of a new mum, Radka and 11 week old baby Ruby jumped a plane and head to Phillipines for her comeback race. “I didn’t have much time to really do much run training before the race. But I thought the Phillipines was going to be so hot that no-one could run fast anyway, so it shouldn’t matter,” she laughed. What happened was truly amazing, Radka shocked everyone picking up the win in 4:25:38 and earning the respect of athletes and mums everywhere. Throughout the year Radka and Ruby have continued to impress on the race course and at airport lounges across the globe. With the International Regatta Centre only a relatively short drive from the Kahlefeldt clan’s Sydney base, racing at IRONMAN 70.3 Western Sydney should be a logistical piece of cake and a win in Penrith and two weeks later in IRONMAN 70.3 Taupo would be the perfect way to wrap up a magical year. “This year has been the best year ever from normal life because we had baby Ruby, but also from the point of my whole career. I didn’t really expect anything from this year I just wanted to race because I love triathlon. I didn’t want it to be at the end of my career because I had Ruby. I just wanted to be back racing but not too seriously and I just wanted to see how I would go. It ended up being the best season for me, so it has been amazing,” Radka said.